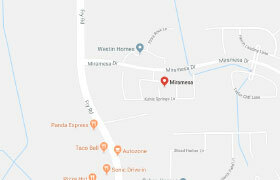 Fill out the form below for details about Miramesa. We’d love to hear from you. *Indicates a required field. From Hwy 290 West, exit Spring-Cypress/Cypress-Rosehill/ Fry Road. Proceed through the light and turn left on Cypress-Rosehill/Fry Road. Continue on Fry Road for approximately 5 miles then turn left on to West Road.